Refrigerants are a crucial part of refrigerators and air conditioning systems. Refrigerants are what keeps everything cool and you can't have a functioning air conditioning system without the right kind of refrigerant. Freon used to be the most popular refrigerant and was widely used in a variety of commercial applications. Unfortunately, it was discovered that freon is very dangerous and it can cause extreme harm to the environment. Freon can damage the ozone layer and it can also cause global warming. New refrigerants have been developed that are safe for the environment and work well in air conditioning systems. 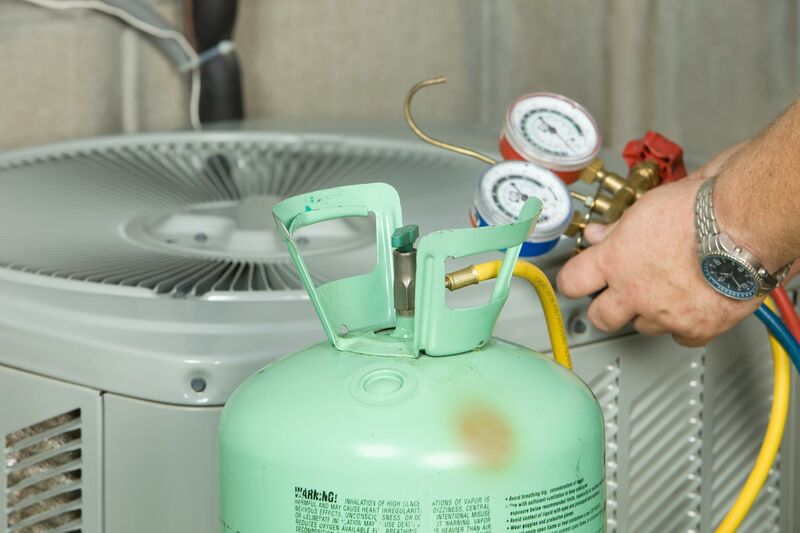 Read on to learn the top 4 refrigerants that are a great replacement for freon. Freon use to be the refrigerant standard. Refrigerant works by absorbing heat and refrigerators and AC systems direct the heat outside and away from the food or the building. Refrigerants are very effective and you can't have refrigeration without them. Freon contains chlorine which is a very damaging chemical. Chlorine is very damaging to the ozone layer and it is also tied to global warming. Freon has been phased out and you can't buy it anymore. Older refrigerators and air conditioning systems need to be replaced, though they can sometimes be retrofitted. Unfortunately, the cost is just about the same as buying a new unit, so you are usually just better off buying a brand new unit. R410A doesn't contain chlorine and it is safe and easy to use. This refrigerant is more efficient and it keeps things colder. R410A is the most widely used freon alternative and you can find it in a wide variety of units. When you need a quality refrigerant you can't go wrong with R410A. R134A is another alternative to freon that is affordable and effective. It isn't banned by the EPA and it is very safe to use. It is important to use safe alternatives to freon because global warming is increasing at an alarming pace and freon can cause a lot of damage, especially since it is so widely used. R134A is cost effective and it is safe for the environment which makes it a worthy alternative to freon. R134A has thermodynamic properties and it is not blended. This means that you save money when you use it since it doesn't need multiple recovery machines. When you use other alternatives to freon, they are blended and this means that you need separate recovery machines so the coolant can be safely used. This refrigerant is often used in air conditioning systems in cars. The refrigerant provides stable and effective cooling in any type of vehicle and it is an affordable refrigerant that is going to be affordable and safe for the environment. This refrigerant doesn't have an effect on the ozone layer and you can find it in every auto shop. If your car AC system needs to be refilled you are going to want to use R134A. If you need a reliable refrigerant for your air conditioning system you can count on R407C. This refrigerant is very common in AC systems and it is made of a mixture of three different chemicals. You can find this refrigerant in ductless split systems and you can also find it in packaged air conditioners. This refrigerant is found in many types of properties including commercial and residential properties. You will also find this refrigerant in refrigerators. Many new systems us R407C and you will find it in a wide variety of new appliances. Nitrogen is often used as a holding charge. You can also use this refrigerant when you are retrofitting a system but you will need to change the oil if you do this. This refrigerant is considered to be very safe and it is going to help your business become more efficient in a variety of ways. When you are looking for an affordable and effective refrigerant that is going to work hard for you and help you in a variety of ways you are going to want to use this type of refrigerant in your systems. It is important to use a refrigerant that is safe and that is also very effective. R404A has a depletion potential of zero which makes it a very good choice in a variety of different situations. You can find it in refrigeration systems that get below zero and you often find it in refrigeration systems in trucks. This refrigerant is common in industrial and commercial transportation since it can withstand cold temperatures in a variety of different temperature ranges. You will get superior performance out of this refrigerant and it works well in a variety of different types of situations. It has a wide temperature range and it also offers superior performance which makes it a good choice. It won't react to air and it won't react to water either. This refrigerant is odorless and it is also not flammable so you don't have to worry about it catching on fire. It is still important to use proper safety procedure when you are working with any type of refrigerant because you don't want any problems. You can get frostbite if you come into contact with refrigerant and the tank can rupture if you are not careful and end up exposing it to heat. You always have to treat the chemicals very carefully if you don't want any problems. Refrigerant can help your business in many ways and it can also help the environment when you use an alternative to freon. The right refrigerant alternative is going to be just the thing you need to get a lot of work done and this refrigerant is powerful and easy to use. When you are looking for freon alternatives you have to consider which alternatives are going to help your business the most and then choose that type of freon alternative for your business needs. Freon alternatives help to protect the environment. Pest Control: Do You Really Want To Do It Yourself? How To Know The Best Renovation Brampton Contractor?